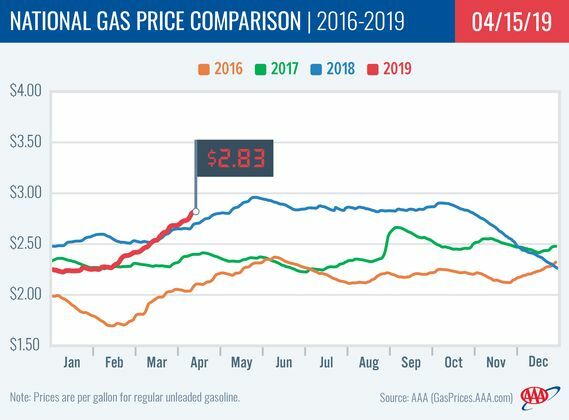 After increasing by 11 cents last week, the average price of gasoline across Western Pennsylvania is another 13 cents more expensive this week at $3.042 per gallon, according to AAA East Central’s Gas Price Report. As the region sees gasoline stocks tighten on the week, a handful of Mid-Atlantic and Northeast states saw significant increases at the pump, including Pennsylvania (+9 cents). Year-over-year, most states in the region have more expensive gas price averages. With a 3.2-million-barrel draw, the region saw the largest decrease in gasoline stocks of any in the country for the week ending April 5. According to Energy Information Administration (EIA) data, total stocks now sit at 60.2 million, which is the lowest level of the year but on par with levels this time last year. Regional refinery utilization remains at 79 percent, but that is expected to increase throughout this month.